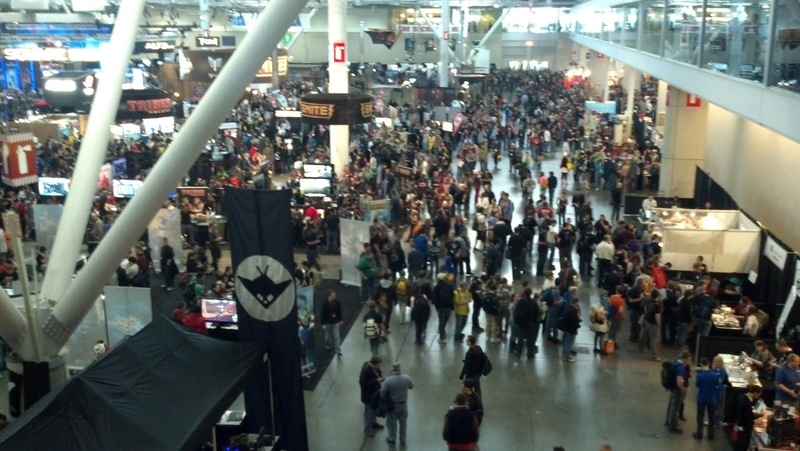 Saturday was my last day of PAX East, sad to say. Family trumps con, and sickness trumps family. More on that later. A view across the expo hall. It was early, so the crowd was thin. I got rolling for 10AM and dropped my bag in the car, then hit the hall. I floated around the expo hall for a bit. I realized that the Chessex booth is the penny candy store for gamers - so many small shiny treasures for short money, and you can't possibly eat just one. I got in line for the Campaign Doctors panel and schmoozed for a bit. IRCing and talking to Tresi who was right next to me in line was surreal and laughably sad in a film-noir-mime sort of way. But then again, living in the future is awesome. And of course E tweets that she's giving away Think Geek freebies as soon as the panel opens up. I drop my stuff and run over to grab something for my daughter and sneak back in just after the panel intros. For the record, it was a China Sackboy, which she immediately categorized somewhere between Lego and Polly Pocket. The panel rocked. I re-met a few audience members who went to our panel the previous night. This panel was shorter than ours, but the questions and answers were very similar so I guess we all know a little something about this RPG thing. Or at least we've learned the same lessons even though they were born of very different experiences. 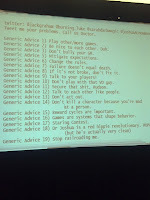 Universal truths in RPGs will resurface in another article over here, I'm sure. I chatted up the panelists and handed out a few cards. Luke says he's always looking for editors, so here's hoping he didn't lose my card. I'll be sending out electronic thank yous in the next day or two to follow up. Once again, the same crew of Enforcers was working in Merman. It was good to have a second chance to hang out with those guys. After that, I hit the expo hall for a bit. I met up with Ben and Rob, but Becky was working too hard for me to introduce myself. Margaret Weis just came back to her booth, so I seized the lull and had a fanboy moment with Jeremy Keller when he signed my copy of Technoir. Win! After that, I could feel the fatigue building so I decided to find a table. Only problem was there were no tables in the Tabletop Free Play areas. So I did the next best thing. I watched a demo of Race To Adventure (a very cool game based on the Spirit of the Century RPG which will be kickstarting next month), then hit up Fred Hicks to sign the copy of Don't Rest Your Head that he gave me last year. 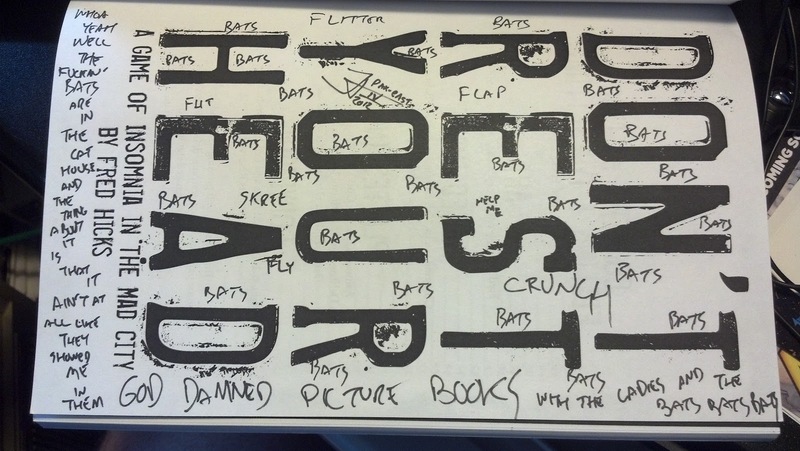 If you have the chance to have Fred sign a copy of Don't Rest Your Head, do so. It is the creative yardstick against which I will hold against all future signings. Fred and Rob Donoghue (both co-Presidents of Evil Hat Productions) invited me to play Lords of Waterdeep. It was on my "strong maybe" list to demo, so I stuck around. And in a true knife-twist, Rob screwed me out of 20 victory points just before my last move. Nicely played. It wouldn't have made a difference in the final tally as I was still fairly far behind from figuring out where to focus my efforts in the game, but it would have possibly gotten me up to third instead of fourth. Fun game, and a great discussion afterward. Rob, I'd love to see the Building Upgrade tweak, as I think that'll tighten things up. That's class, pure & simple. I walked up to the Kickstarter room, but it was half-empty. Only the electronic games folk were there. 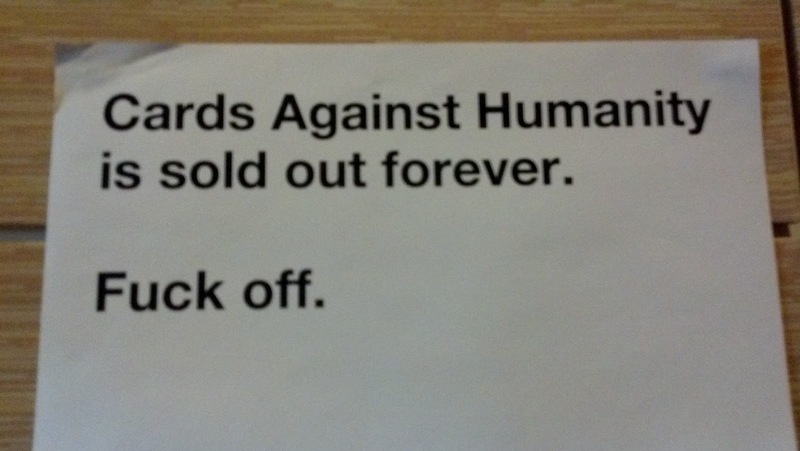 And Cards Against Humanity was sold out, much to Dan's chagrin. I hit my wall. The exhaustion caught up with me, and I decided to head home around 6, far earlier than I wanted to. Had I the energy there would have been games aplenty, including Car Wars: The Card Game that I had promised to a few people. Sorry about the early bail everyone, but my body had had enough. And it turns out, what I thought was allergies turned out to be a cold. On Sunday I cracked my way through The Hallelujah Chorus once and skipped he second service. My mother bailed on brunch for the same reason, and nobody wanted to get my grandparents sick, so I crashed in the afternoon. The cold explains the exhaustion, and I'm still recovering after having it for a week. I apologize if I infected anyone. Extra apologies to Tresi - that'll learn you to hand me your new iPad and explain FreeMarket to me. Next year I'm thinking of making a T-Shirt saying "PAX Pox: Patient Zero" and if I'm not sick I'll fake sneeze my way through the con. 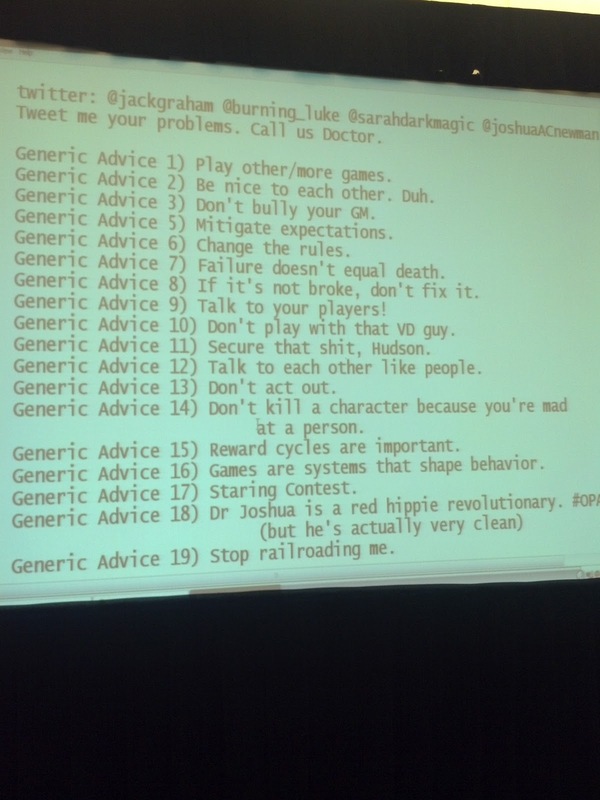 And then I thought why not turn it into a viral con game? I'll check with Charley and Mark to see if there's anything written down about the Zombie viral game from that long-past Intercon. I thought I would tack on a list of con goals here, but I think I'll separate it out into another post to make it easier to keep score. And I've got a more philosophical PAX post coming after that. Stay tuned.